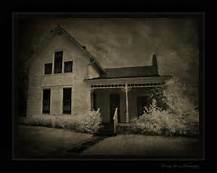 The Murder House: Iowa Axe Murder House! The eight victims, which included Joshua & Sarah Moore, their four children and two Moor children that were spending the night. All eight victims were found bludgeoned to death with an axe. It was suspected that the killer was waiting for the family in the attic as two cigarettes were found in the attic and were believed to have belonged to the murderer!… All the eight victims were slaughtered during the night and they were killed with such forced that axe marks were left in the ceiling along with over items of furniture. The killer left the axe in a down stairs guest room, and a blood-filled bowl was found in the kitchen! Before leaving the killer also draped clothes over the smashed up faces of the eight victims, along with covering up every window and mirror in the house with cloth. There was a lengthy investigation that turned up several suspects no one was ever charged for the crimes and these terrible murders have never been solved and the killer got away with murder. Today, the house is a tourist attraction and you can visit it, it is also a hot spot for ghost hunters and is decorated as it were that fateful night. Everyone who has stayed there have all reported the same thing. A sense of heaviness, orbs, sounds, and a sense of not being alone in the house! There is also reports of a whistle that goes off at around 2am… It is said that this is the time of the murders! The fact that someone with such hate and anger, that could do such a terrible thing towards other people, was never caught and punished for these horrendous murders makes this case a lot more chilling! Next post: Episode 16: Ape-Men From Around The World: This episode looks at the Ape-men from around the world!